We Still Live in a Yellow Submarine . Beatles Radio: The Beatles, Solos, Covers, Birthdays, News The Fab 4 and More! 50 years after its release, the cartoon classic ‘Yellow Submarine’ continues to delight. Once upon a time — or maybe twice — the Beatles released a full-length animated adventure for children of all ages (especially 64). 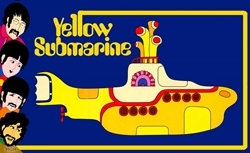 Inspired by their song “Yellow Submarine,” the auditory equivalent of a cartoon, the movie depicts a psychedelic voyage through time and space set to a soundtrack of classic Beatles tunes, some of which were written for the film. This summer, Yellow Submarine returns to theaters in a glorious 4K restoration with a fresh 5.1 surround sound remix of some of the Fab Four’s best songs. (Click here for tickets.) So take a musical trip with me to the magical undersea world of Pepperland. Just be careful not to press the wrong button or pull the wrong lever in the submarine. And always watch out for Blue Meanies!